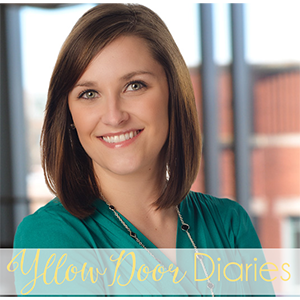 Q: Where did the title “Yellow Door Diaries” come from? A: My husband! He had been helping me brainstorm, came up with the name while opening our bright yellow front door while leaving for work one morning. It pretty much stuck immediately since our door is my favorite change I’ve made in our home since we moved in! A: I am a business development consultant for professional service firms. I enjoy the flexibility and being able to work from home, while still being able to help clients expand their own business and footprint. Q: Outside of work and blogging, how do you spend your time? A: I tend to stay pretty busy! I love spending time with my family and friends, and that usually means a weekend trip somewhere to visit. I like to read, cook, attempt to garden, playing with my pup, Piper, and I really enjoy spending quality time with my hubs, Spencer. In the fall, I spend a lot of time at the soccer fields supporting Spencer, who is a collegiate soccer coach. Life is full, but that’s what makes it fun! A: As far as my home, I would say my style is casual cottage shabby-chic. I made that up. Think distressed furniture, white and pastel colors, a lot of sunlight, and neat knick-knacks. My entire home doesn’t look like this, but hopefully after each project, it will more reflect this blend of styles I love the most. In the meantime, a girl can dream – and pin! A: Pleasure? As in, singular? I wish. Shopping (especially for home decor). Anything on Bravo. Or TLC. Or HGTV. Or Food Network. Speaking of food…cheeseburgers. With a lot of toppings. Dark chocolate. Cheese. Wine. Wine and cheese. Manis and pedis. And back rubs. Even the at-home kind! I’d better stop before this answer gets out of control.